We are a group of front-end fanatics. We want to move the web forward, without breaking it. There's a new front-end technology every. single. day. New devices, new browser APIs, new frameworks, libraries and more. How do use all these new goodies without breaking what's already there? 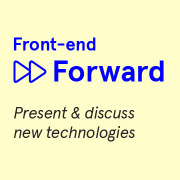 We meetup in Amsterdam to present and discuss new front-end technologies and best practices. We'll be sure food and drinks are available while sharing your experiences.